If there is one thing people need, it is water. Did you know that a human can survive days without food but never without water? If earth is covered with approximately 71.11% water, the human body is approximately 60%. Having said that, water, in whatever quality or condition, is actually a man’s best friend. And being that we are human, we are made with such complexity that if we put garbage in then definitely what goes out is garbage as well. Simply put, we need quality and healthy water to make our body healthy and strong. We have seen and read a lot of tap water reviews or studies made by mostly government agencies and water utility companies. And more often than not, these reports do not disclose every nitty gritty detail of what the consuming public must know. However, in a study made by an independent organization with a strong advocacy in watching out for environmental toxicity, Environmental Working Group (EWG), there are a total of 315 contaminants in U.S. tap water. These result were based on the various tests conducted by water utility companies from various areas within the United States from 2004-2009. And because of this research they are recommending that consumers use a water filter system that can somehow lessen if not eliminate all toxins that exist in our ordinary tap water. That brings me to an in-depth review of one of the more popular and sought-after brands in the United States, the Aquasana Water Filter System. The Aquasana Water Filter System is manufactured by Sun Water Systems, Inc. A company, who’s been manufacturing high-end home water filter systems for the last 50 years. They produce drinking water filters, shower water filters and whole house water filters, all with one aim in mind – to provide quality and economical filtration system that can provide quality tasting and healthy drinking water. Aquasana Water Filter System boasts of several awards and citations. It was awarded the Best Water Filter by the Consumer’s Digest Best Buy Award for performance and cost per gallon in 2003. It garnered a Gold Customer Service Award and got a 4.9% rating out of 5% from Amazon.com, where consumers are the ones rating each product they buy. Additionally, all Aquasana filters boast of their multi-stage selective filtering system. With this system, several filtration processes take place namely carbon filtration, ion exchange and sub-micron filtration. When others provide one filter on their water filter system, Aquasana has dual filters that definitely takes away more of the contaminants that ordinary filters cannot remove including stubborn by products of chlorine that causes sickness and other related diseases. With these kind of filtration, rest assured that more contaminants are eliminated thus making your drinking water healthy and a real quality. 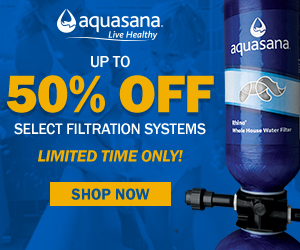 Let’s get a rundown of the various Aquasana Water Filter Systems currently on the market. Otherwise known as the Countertop Water Filter, the Aquasana AQ-4000 is the most popular product of Aquasana. Having earned the Best Water Filter Award by the Consumer Digest Magazine for six straight years, the countertop water filter is easily installed on top of any kitchen faucet and provides 30 gallons an hour of filtered water. Cartridges maybe replaced every 6 months and is available at any retail outlets or the Aquasana shop. Consumers also have the option to enroll in their Auto Ship Water for Life Program where you get your cartridges automatically every six months at further reduced cost. If the AQ-4000 is the Countertop Water Filter, AQ-4500 is the Under Counter Water Filter System. Just like it’s famous counterpart, the AQ-4500 follows the patented dual filtration system. And because of this, it filters out chlorine, cysts, which are by products of chlorine, lead and other Volatile Organic Chemicals (VOCs) that make their way in our ordinary tap water through septic system cleaning, weed and pest control, fumigation, and dry cleaning. VOCs is the umbrella term given to various synthetic chemicals that greatly affect our body. Studies show that when these VOCs are ingested, it may cause cancer, liver and kidney malfunctioning and disruption of the nervous system’s performance. Additionally, when inhaled, it would severely affect the tissue of the lungs and skin. Unlike the AQ-4000, the AQ-4500 water filter system is installed under the kitchen sink. Much that it provides instructions in installation, it is wise to seek the assistance of a certified plumber for optimum performance. On the other hand, there is also the AQ-4501 Premium Water Filter which has the same characteristic as the AQ-4500 and the only difference is that they use premium faucets. This type of water filter system provides quality water for water fountains, icemakers and refrigerators supply line. It does contain the filtration system most Aquasana water filter system offers. It eliminates turbidity, cysts, chlorine, lead, THMs or trihalomethanes. THMs are chemical compounds that are formed as a result of a reaction between organic materials in drinking water and chlorine added as a disinfectant. These are one of the many byproducts of water chlorination, which when ingested in drinking water, can cause a number of physical problems like spontaneous abortion and miscarriages. They are also known to cause bladder and rectal cancer and can adversely affect nervous system functioning, as well as trigger liver and kidney malfunctions. These models are otherwise known as the shower filters. As the name implies, its basic function is to provide quality water even while you are taking a shower. The AQ-4100 is directly placed on the shower spouts while the AQ-4105 are handheld massage wands. The shower filters of Aquasana, just like any other model of the brand, carries with them the dual-filtration system. Stage 1 of the filtration removes chlorine and enhances pH balance with a natural copper/zinc mineral media called KDF-55D. Stage 2 of the filtration stage uses a carbonized coconut shell medium for the removal of synthetic chemicals, THMs and VOCs that vaporize from tap water and are inhaled or absorbed through the skin, potentially causing adverse health and cosmetic effects. The Aquasana shower filter system installs in seconds and provides healthy filtered water for showering. It aids people with skin conditions and breathing disorders. Additionally due to its quality water and elimination of chlorine, it also provides extra moisture in your skin and in your hair. Users boast of improved moisturized skin and lustrous and shiny hair. In fact, Aquasana is so confident of the effects of the water filtered under their system that they offer a money back guarantee in cases where you do not experience the benefit it claims it would give you. If you tried swimming in a chlorinated pool and get the dry effects the chlorine in the pool gives your hair and your skin, with the Aquasana shower filter, those problematic days are gone. The water coming out of the shower filter system is guaranteed to give you the cosmetic benefits it is widely popular for. The shower filter comes complete with the two-stage filter cartridge that lasts 6 months and the deluxe Niagara adjustable pressure showerhead. Additionally handheld shower wands are available for purchase separately. When you care for the people you love, you only want the best for them, right? For every product that Aquasana makes, foremost in their mind is to provide a long lasting relationship with their customers. As such, they give them a wide variety of choices that would suit your budget and still enjoy the benefits of having a quality and healthy drinking water. As part of the company’s commitment not only to service excellence but to quality products as well, Aquasana brought to its consumers the Rhino E-300 Whole House Water Filter System. With the Rhino Whole House Water Filter System, you need not worry which faucet to open to ensure safety. The whole house filter system provides you with the state of the art dual filtration system of Aquasana and not only to your kitchen or your bathroom while taking a shower. It provides quality water for the whole house in general. The Rhino Whole House Water Filter has completed three years of evaluation by Underwriters Laboratories. The product, the factory and all performance claims are certified by UL under the strictest industry guidelines. In fact, no other whole house filter system boasts of such great documentation than the Rhino E-300 Whole House Filter System. With a 10-year history of outstanding quality performance, it has the Best Rating ever accorded by the Underwriters Laboratories. The Rhino EQ-300 can be installed by any plumber and comes complete with main filter unit, pre-filter, installation kit, shut-off valve and required hardware. Typical installation takes 1.5 to 2.5 hours by a licensed plumber, and is usually done in your basement, garage, or water closet. The main filter unit is easily replaced (no plumber needed) every three years For less than $20/month you can have clean, healthy water flowing from every outlet in your home. The Rhino E-300 is less expensive than bottled water, and you drink, shower, bathe and live in healthy water! You will notice softer skin and hair in just a few days by showering and bathing in filtered water. And because Aquasana values the quality of their product and the benefits it gives to their consumers, it comes with a money back guarantee. If at any one time you feel that the benefits the product claim is not true, you can return the unit and the company will happily refund you. That is how they are confident about the product they sell. The most stringent tests have been performed on the Aquasana products in California. The water filters comply with NSF Standards 42 and 53, and are certified by the California Department of Health Services Drinking Water Treatment Device Program. California has the strictest requirements in the United States. It can also provide its consumers with documentations and proofs of its various certifications from several certifying bodies. In fact, in comes with the product itself. Aquasana is indeed the best choice for water filter system. The comprehensive review made about the various Aquasana water filter system products could give you a complete view of the product, its quality and its capabilities. No other brand can offer these kind of quality and these kind of assurance. Much that there are cheaper brands of water filter systems out in the market, Aquasana would look expensive. However, comparative analysis would show that Aquasana is the most economical brand. Despite the dual filtration system, but with the filters being replaced every six months and the main one after three years, the cost per year of expense is lower than those filters that require replacement on a quarterly basis. So next time you think of providing the most affordable but a quality appliance for you and your loved ones, think Aquasana. It’s the only water filter system that could give you black and white proofs of certification and the only product that could give you the value for your money! With its expertise in the manufacture of home water filter systems for the last 50 years, nothing comes close to Aquasana. The Aquasana Water Filter System – quality, affordability, economical and fantastic customer service. What more can you ask for? Aquasana is one with its consumers in providing the healthy water every person on planet earth deserves. The choice is yours – would you settle for those brands that promises benefits and economy without proofs or would you rather settle for a brand that offers you the quality, the proof and the assurance that indeed what you are buying is definitely worth your life! Choose and decide.